As noted in the Commentary “The view favored by Seventh-day Adventists is that these trumpets retrace, to a large extent, the period of Christian history already covered by the seven churches (chs. 2; 3)and the seven seals (chs.6; 8:10), and that they emphasize outstanding political and military events during this period.” (7BC 788) In other words, Adventists favor the concept that the seven trumpets and seals recapitulate the history of the seven churches. This view has a long history, dating, at least to the time of Uriah Smith as we noted in our study of recapitulation. It somewhat understandable that this view should be so greatly favored if for no other reason that the five main visions and prophecies of the book of Daniel were arranged in that very manner. For example, the symbols found in the seventh and eight chapters basically repeat the gold, silver, brass and iron of the great image of chapter 2. 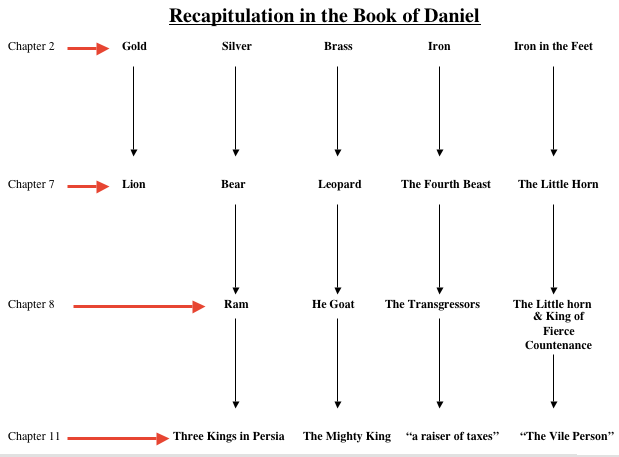 Note, however, that each of Daniel’s visions follow the progression formate with the silver following the gold, the brass following the silver, and the iron following the brass in Daniel 2. Likewise, the bear following the lion, the leopard followed the bear and the fourth beast followed the leopard in chapter 7. The same applies to the ram and the he-goat in chapter 8. Then, of course, the same progression formate is seen in chapter 11. Nevertheless, it need not be surprising that such men as Uriah Smith took up the recapitulation formate and applied it to the book of Revelation, probably because they considered it to be made up of a number of different visions rather than one. Some twenty years after 1873, when Daniel and the Revelation were published, Mrs. White wrote: “We are not to think, as did the Jews, that our own ideas and opinions are infallible; nor with the papists, that certain individuals are the sole guardians of truth and knowledge, that men have no right to search the Scriptures for themselves, but must accept the explanations given by the fathers of the church. We should not study the Bible for the purpose of sustaining our preconceived opinion, but with the single object of learning what God has said. “Some have feared that if in even a single point they acknowledge themselves in error, other minds would be led to doubt the whole theory of truth. Therefore they have felt that investigation should not be permitted, that it would tend to dissension and disunion. But if such is to be the result of investigation, the sooner it comes the better. If there are those whose faith in God’s word will not stand the test of an investigation of the Scriptures, the sooner they are revealed the better; for then the way will be opened to show them their error. We cannot hold that a position once taken, and idea once advocated, is not, under any circumstances, to be relinquished. There is but One who is infallible–He who is the way, the truth, and the life.” (Gospel Workers, 1893 edition, pages 125-131; also Testimonies To Ministers and Gospel Workers page 105). Therefore, instead of jealously guarding and protecting the preconceived, recapitulationists view of the seven churches, seals and trumpets, a reconsideration of that concept is actually a divine imperative in spite of Ellen White’s warm endorsement of Uriah Smith’s valuable effort to explain the mysteries of the books of Daniel and Revelation. It was a good effort, worth reading even today, but it was not the “last word” even from Mrs. White’s point of view. At this juncture, lets address ourselves to the other “option” brother Mueller alluded to which is “progression,” the alternative to “recapitulation.” He asserted that “progression, as opposed to recapitulation, discerns only one final climax in the Book of Revelation. Everything leads up to this culmination. 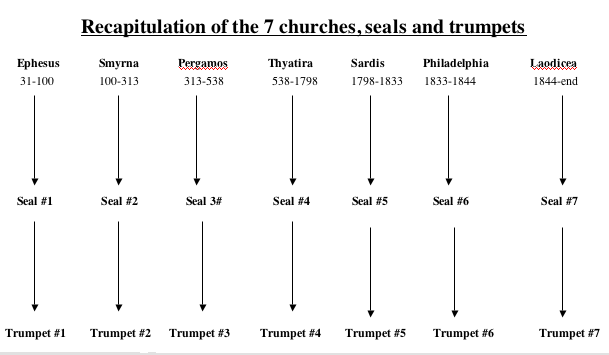 For example, the seven trumpets do not, to a certain extent, cover the same ground which the seven seals have already encircled, but grow out of the seals and are their extension.” In other words, in the progression formate, each church, seal and trumpet are allowed to stand on their own and are not to be considered parallel to each other. This is why brother Mueller comments: “If one chooses progression one will end up with a different end time scenario from the one recapitulationists hold.” He leaves it up to the individual to decided whether that is a good or bad choice. It is true that the seven churches depict the condition of the church throughout the Christian era, as stated in the Spirit of Prophecy. But, even though “The names of the seven churches are symbolic of the church in different periods of the Christian Era”, the statement continues that “The number 7 indicates completeness, and is symbolic of the fact that the messages extend to the end of time, while the symbols used reveal the condition of the church at different periods in the history of the word.” (AA 585) This means that we cannot safely dismiss even the past six end time messages! It is of major importance to us that we at least understand (1) the “first love” of Rev.2:4; the “synagogue of Satan” (Rev.2:9); the doctrines of “Balaam” and the “Nicolaitans” (Rev.2:14, 15); The doctrine of “that woman Jezebel” (Rev.2:20); the “name that thou livest, and art dead” (Rev.3:2); the “synagogue of Satan” (Rev.3:9); and the “lukewarm” condition (Rev.3:16). In that case, we need to seriously consider the messages to all previous six churches and add them to the problems good and bad to our church in Laodicea. Could that be the reason Jesus’ recommended “eyesalve” as one of the needed remedies for the ills of our church? In this study, we will have to skip over most of the details of the book of Revelation and focus on what I call transition points; namely the last church, the last seal, the last trumpet and the last plague. That will help us substantiate the fact that the seven churches, seals, trumpets and plagues stand alone and follow each other sequentially rather than standing together in parallel. If understood in that manner, it will be seen that the seven churches, seals, trumpets and plagues comprise a skeletal framework upon which all the other details in the Revelation can be assigned. The potential is that this view not only causes the Revelation to become far more understandable, it will become far more relevant to us who are living in the final moments of this world’s history. In this scene John is looking through a “door” into heaven whereas in chapters 2 and 3 he was looking at the seven churches on earth. So, while chapters 2 and 3 concerned the problems, both good and bad, of the seven churches on earth with the last being among the worst, this chapter raises our eyes to the very place in heaven where Jesus was actually standing — in the heavenly sanctuary where He had just been delineating the characteristics (good and bad) of the seven churches in chapters 2 and 3. Note the words “after this” in verse 1. The Commentary, which espouses the recapitulation view, suggest that “the words ‘after this’ do not imply any chronological relationship between the closing events of the preceding vision and the one about to be related.” (7BC 766) But, in consideration of the progression view that we are adopting in this study, the word “this” can easily be seen as indicative of the last church of Laodicea and that the things depicted in chapter 4 are indeed chronologically related to that church and should be interpreted in the context of the last church rather than the first church of Ephesus as held in the recapitulation view. Therefore, this scene does not depict Christ’s enthronement in heaven (that actually took place more than thirty years before John received this vision), but it does set the stage for an equally important occasion, the details of which are spelled out in chapter 5. So, it is inescapable that we belong to the very “last church” and, as noted in the above quote, we have no excuse for not knowing “what is to come upon the earth” or what will take place in the future. That statement suggests that Jesus Himself in the last book of the Bible has laid it all out for us and that the progression formate, which places the whole book of Revelation as indicative of “the perils and conflicts BEFORE (not behind) US,” is what He actually had in mind. At this point, begin to compare the scene here with that of Daniel 7:9 where Daniel “beheld till the thrones were cast down, and the Ancient of days [God the Father] did sit whose garment was white as snow, and the hair of his head like the pure wool: his throne was like the fiery flame, and his wheels as burning fire.” That is remarkably similar to Jesus’ appearance in Rev.1:13-15. But to John in this scene, the appearance of God the Father is likened to precious gem stones in verse 3. Since “seven lamps of fire” are seen “burning before the throne” in verse 5, it is clear that this was the first apartment of the heavenly sanctuary. (see GC 414 and PP 356). Another point to consider is that of the “four beast” (“living creatures”) in verse 7, each announce the opening of the first four seals of chapter 6 saying “come and see.” This suggests that this scene into the heavenly sanctuary is closely connected to chapter 6 where the first six seals are opened. It also suggests that none of the seals were opened prior to the church of Laodicea. Another important point to recognize, is that the praise service depicted in verses 8-10 is being rendered to God the Father with Jesus and John looking on. Therefore, this scene is not the enthronement of Jesus which took place more than thirty years before. Finally, while Jesus is also depicted in John 1 as the creator, God the Father is also The Creator and Jesus wanted John and us to understand that. 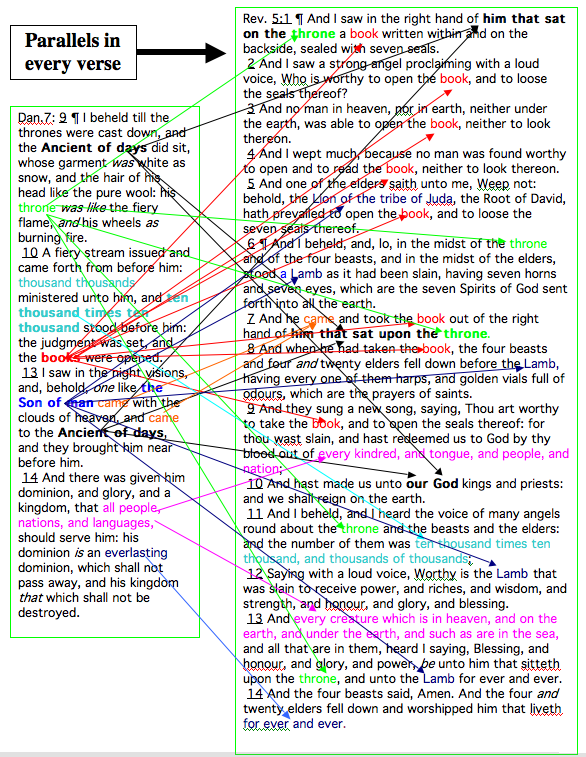 Although the many arrows might, at first, seem confusing, look carefully at their colors and it will be seen that there is close correspondence between Daniel 7:9, 10 and 13 with Revelation 5. If the scene in Daniel 7 is the Investigative Judgment (see GC 479, 480), Revelation 5 also depicts the Investigative Judgment scenario and complements the same scene in Daniel 7. Clearly, this is what makes “the fifth chapter of Revelation” of such “great importance as noted in 9T 267. This judgment is of enormous importance “to those who shall act a part in the work of God for these last days” which is in the context of the last church. It follows, that those who do not realize this are “deceived” and we should pray that our eyes will be anointed with the “eyesalve” Jesus offers the Laodiceans in Rev. 3:18. In other words, the content of this book, as well as the “books” of Daniel 7:10, is absolutely comprehensive, inclusive of all that has ever happened to every person, nation and kingdom who has ever existed from the beginning to the end of time. Therefore this “book” must be identical to the “books” of Daniel 7:10. Clearly, it is a book of records that enables the onlookers, depicted as “ten thousand times ten thousand, and thousands of thousands of” “angels” (verse 11) in heaven to praise God for the justice and mercy of His Judgments. Bear in mind that it is opened to the angels in heaven. It will be opened later on to the view of God’s people during the “thousand years” mentioned in chapter 20 verse 4. So, it is clear that “him that sat on the throne” in verses 1 and 7 as well as ch.4:2, 3, 9 is the same Person called “the Ancient of days” in Daniel 7:9, 13 and 22. Likewise, the “Lamb” who “came and took the book out of the right hand of him that sat upon the throne” in Revelation 5:6, 7, is the same Person depicted as “one like unto the son of man” who “came to the Ancient of days” in Daniel 7:13. Those similarities as well as other parallel details between Revelation 5 and Daniel 7 is clear evidence that Revelation 5 depicts the commencement of the Investigative Judgment that began at the end of the 2300 days of Daniel 8:14 October 22, 1844. 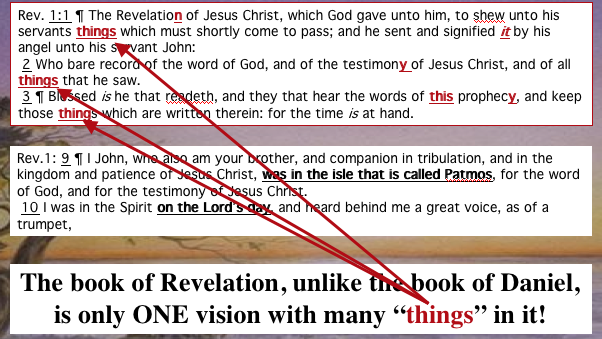 For more information on that point, check out the above diagram and the discussion of Revelation 5 in the following exposition. 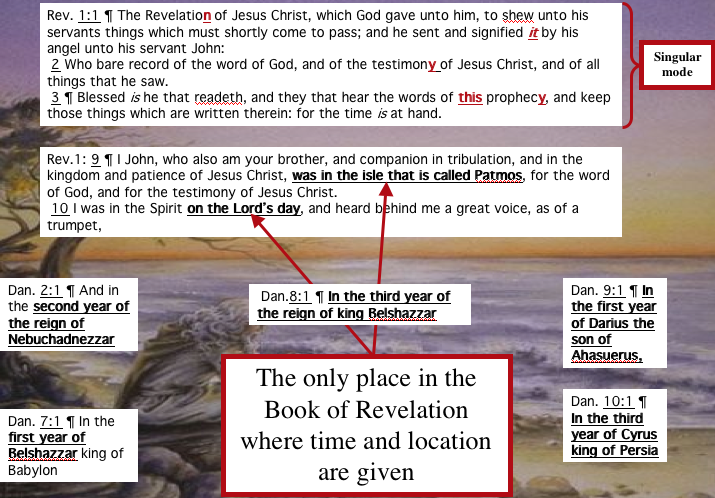 There you can find more discussion and illustrations of the parallels existing between Revelation 5 and Daniel 7:9, 10, 13. So, it is in the context of the Investigative Judgment that the seven seals begin to be opened. There is nothing in either chapters 4 or 5 to suggest we must look back to the first church of Ephesus to find parallels to the seals as the recapitulation view recommends. Therefore, it should be clear that the scenes depicted in chapters 4 and 5 are contextual with the church in Laodicea beginning in 1844 and extending to the end. It was only during that time that our Lord made His way from the holy to the most holy place in the heavenly sanctuary to begin the Investigative Judgment. That scene is depicted here in one of Ellen White’s marvelous visions: “I saw a throne, and on it sat the Father and the Son. I gazed on Jesus’ countenance and admired His lovely person. The Father’s person I could not behold, for a cloud of glorious light covered Him. I asked Jesus if His Father had a form like Himself. He said He had, but I could not behold it, for said He, ‘If you should once behold the glory of His person, you would cease to exist.’ Before the throne I saw the Advent people–the church and the world. I saw two companies, one bowed down before the throne, deeply interested, while the other stood uninterested and careless. Those who were bowed before the throne would offer up their prayers and look to Jesus; then He would look to His Father, and appear to be pleading with Him. A light would come from the Father to the Son and from the Son to the praying company. Then I saw an exceeding bright light come from the Father to the Son, and from the Son it waved over the people before the throne. But few would receive this great light. Many came out from under it and immediately resisted it; others were careless and did not cherish the light, and it moved off from them. Some cherished it, and went and bowed down with the little praying company. This company all received the light and rejoiced in it, and their countenances shone with its glory. “I turned to look at the company who were still bowed before the throne; they did not know that Jesus had left it. Satan appeared to be by the throne, trying to carry on the work of God. I saw them look up to the throne, and pray, ‘Father, give us Thy Spirit.’ Satan would then breathe upon them an unholy influence; in it there was light and much power, but no sweet love, joy, and peace. Satan’s object was to keep them deceived and to draw back and deceive God’s children.” (EW 54-56) Clearly, this heavenly scenario applies to both Daniel 7 and Revelation 5. 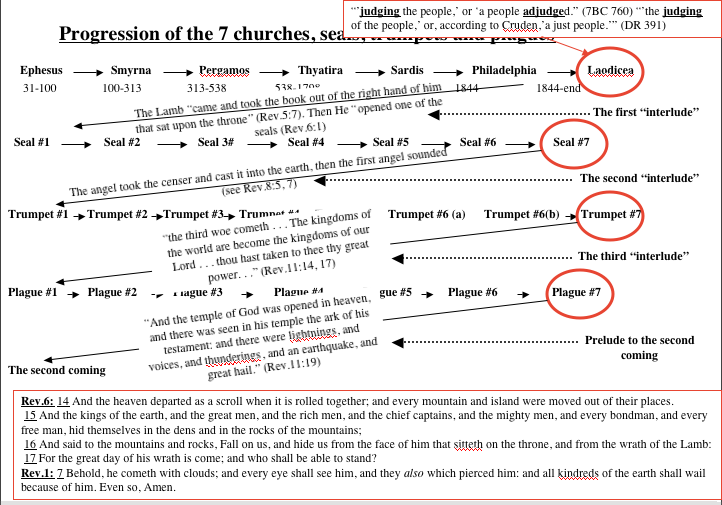 So, once again we see that the last church is the transition point from the seven churches to the seven seals with chapters 4 and 5 becoming the first “interlude” between the seven churches and the seven seals. 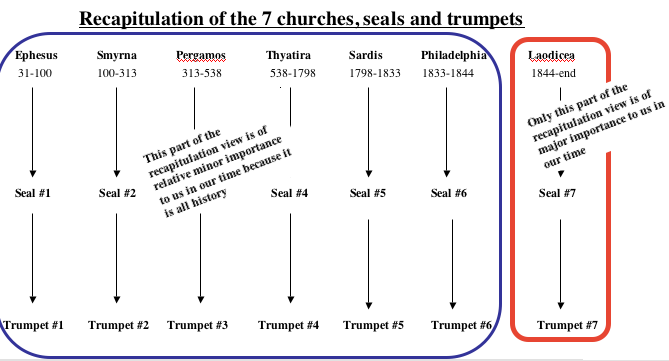 In this next diagram we skip over the details of the first six seals to focus on the seventh to see if it, like the seventh church, is a transition point from the seals to the trumpets. Instead of being broken up into unrelated segments with the second coming in verse 1, followed by the blowing of the trumpets in verse 2 followed by the continuous ministry of Christ in verses 3 and 4, then the close of probation in verse 5 as presented in the recapitulation view, verses 1 to 6 can easily be seen as one continuous, unbroken scenario in the progression view. In that manner, the “silence in heaven” which lasts approximately thirty minutes instead of two weeks, denotes the situation with the heavenly onlookers who are waiting with baited breath as the seven angels are being given their trumpets, then Jesus exits the most holy place of the heavenly sanctuary with the golden censer in His hand from which incense had been ascending before God the Father during His most holy place administration. While the Commentary suggests that the seven angels “blow their trumpets” in verse 2, it is important to recognize that they do not blow them until verse 7 after Jesus casts the censer down in verse 5. Consider also that Jesus takes the incense out of the censer and places it on the golden altar, then fills the censer entirely with fire of the altar without incense and casts it down to the earth. Since the incense represents the “blood of atonement,” His atoning ministry has come to an end. Probation is closed at this point. Then, the waiting, trumpet bearing angels began to blow their trumpets in verse 7 which shatters the “silence in heaven” depicted in verse 1. Therefore, in contrast to the recapitulation view, this all happens in logical sequence, and the second coming, which is supposed to take place in verse 1, has not yet occurred. Several more events are yet to take place. Consequently, Rev.8:1-6 can be seen as the second “interlude” between the seventh seal and the first trumpet. 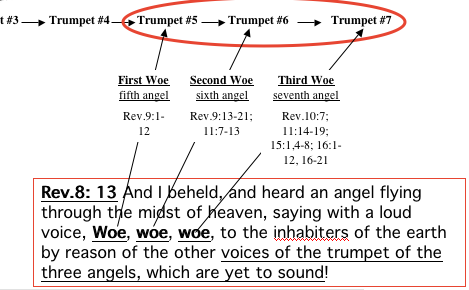 According to Revelation 8:13 which follows the sounding of the fourth trumpet in verse 12, the last three trumpets are called “WOE’s.” Notice that each “woe” is identified by three names. The “first woe” is synonymous with the “fifth angel” and the fifth trumpet. The “second woe” is synonymous with the sixth angel and the sixth trumpet. Likewise, the “third woe” is synonymous with the seventh angel and the seventh trumpet. Uriah Smith (DR 491) basically points out the same thing. That might seem elementary at this point, but it is essential to understand that because they are so easily confused as we look farther into the seventh trumpet “third woe” scenario. Note that the “seventh angel” is depicted three times in the book of Revelation, but only the “seventh angel” in Rev.10:7 and 11:15 is the “third woe.” The “seventh angel” of Rev.16:17 is a “vial” bearing angel and is not the “third woe” or the seventh trumpet bearing angel. When “the seventh angel . . . shall begin to sound . . .” his trumpet in Rev.10:7, “the mystery of God should be finished.” In Rev. 11:15 “the seventh angel [also] sounded” his trumpet sometime after the two witnesses “shall have finished their testimony” in Rev.11:7. But in Rev.16:17 “the seventh angel poured out his vial . . .” which is the last of the seven last plague scenario. The same thing pertains to the “sixth angel” which is mentioned three times in Rev.9:13, 14 and 16:12. However, only the “sixth angel of Rev.9:13, 14 is the “second woe” because they “sound” the “trumpet, while the sixth angel of Rev.16:12 has a “vial,” not a trumpet. In Revelation 11:14, we note that the “third woe” begins when “the second woe is past.” Since the “second woe” mentioned only in Rev.11:14, it becomes necessary to refer to the above diagram showing that the “second woe” is also the “sixth angel.” Therefore, the beginning of the second “woe” is found in Revelation 9:13, 14 and ends in Revelation 11:13. But, that does not mean all of chapter 10 and most of chapter 11 depict the second woe or sixth trumpet! 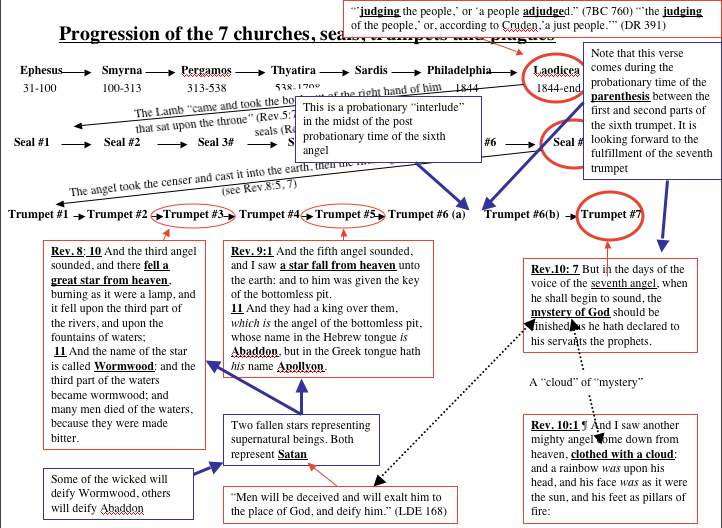 Remember, the “sixth angel” of Rev.9:13,14 is also “the second woe” of Rev.11:14 as can be recognized in the previous diagram. Note that there are two parts to the “second woe” with the first part beginning in Revelation 9:12, 13 and ending in verse 21. 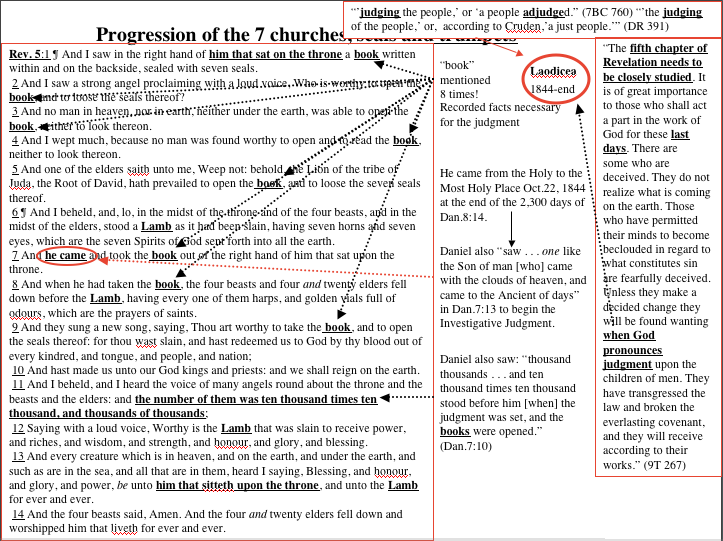 The second part begins in Revelation 11:7 because that is where the “testimony” of the “two witnesses” is “finished” or that probation had closed, the same thing that happened when Jesus, in Rev.8:5, “took the censer, and filled it with fire of the altar, and cast it into the earth” which was the sign the seven trumpet bearing angels were waiting for to begin sounding their trumpets. The intervening portion which separates the first and second parts of the sixth trumpet is found in Rev.10:1 to 11:6 which depict a probationary scenario. During that time the “little book” of Daniel was intensely studied by such men as William Miller who concluded that Jesus would come in 1844 at the end of the 2,300 days of Daniel 8:14. Their disappointment is represented by the bitterness that John experienced after he ate the “little book.” Unknown to God’s people at that time, the judgment of the dead had just begun in heaven. Following that bitter experience, God’s people were expected to “prophesy again before many peoples, and nations, and tongues, and kings. Then, when their “testimony is finished in Rev.11:7 probation has closed and the second part of the post probationary sixth trumpet scenario commences in verses 8-13. 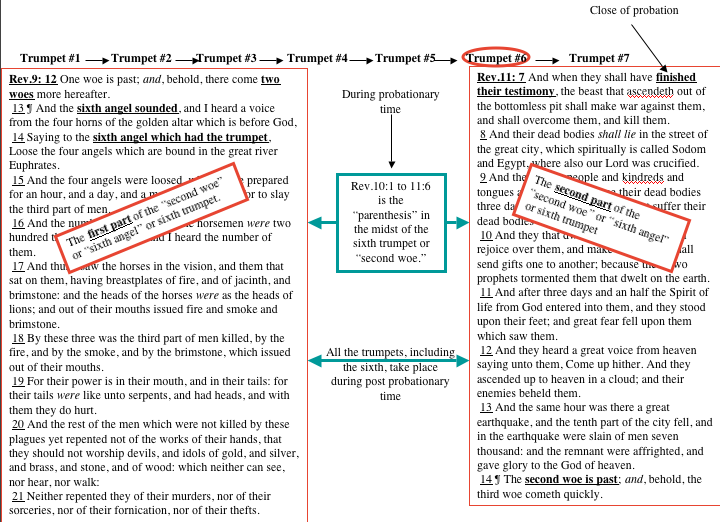 Although this seems confusing and we wonder why God inspired John to write this part of his vision in this manner, we should recognize that Rev.10:1 to 11:6 is the parenthetical portion in the midst of the sixth trumpet that reverts back into probationary time and becomes what we could call an “interlude” or “parenthesis” between the first and second parts of the sixth trumpet instead of “between the sixth and seventh trumpets” as the Commentary, speaking from the recapitulation view, suggests (see 7BC 804). But, it is not a matter of “maintaining” a preferred point of view. What matters is which view harmonize with scripture rather than forcing scripture to harmonize with one’s point of view. At first glance, this might be confusing with many arrows pointing this way and that. But, keep looking and try to follow where the arrows are pointing. Begin with the box containing Rev.10:7 where the sounding of the seventh trumpet will finish the “mystery of God.” Then look down to the box containing Rev.10:1 where that “mystery” is represented by the “cloud” that cloths the “mighty angel” who is Jesus Christ (7BC 971). This suggests that, during the time of the trumpets, the literal identity of the true God will be a great question in the minds of the worldly inhabitants during the post probationary time of the trumpets. In order to understand why that is such a “mystery,” we must refer back to the third and fifth trumpet scenarios where two fallen stars are depicted. While the recapitulationists (except for Mervyn Maxwell) hold that they represent Attila and Mohammed who are only human, it is clear that both represent Satan (see God Cares Vol.2, pages 240, 250) who will be deified as noted in LDE 168. As the blue box indicates, some worship “Wormwood” as God while others follow “Abaddon” suggesting there will be a great polarization in the world during that time with some holding to Abaddon as God and others holding to Wormwood. Then look at the two blue boxes above with the arrows pointing at the space between trumpet #6 a and #6b. They are trying to show that that “mystery” will have begun during the probationary interlude of time when the loud cry of will be given by the two witnesses (Rev. 11:3 to 6) warning the world that they are soon to be deceived by the greatest satanic hoax that has ever been perpetrated upon the world. The Commentary suggests that “the mystery of God is ‘the mystery of the kingdom of God’ (Col.2:2) and ‘the mystery of Christ’ (Col.4:3).” (7BC 798) Uriah Smith believed it to refer to the time “when the great work of mercy for fallen man is completed . . . proclaiming in tones like thunder the solemn sentence, ‘It is done!’ Revelation 16:17.” (DR 525) So, both are, in essence, correct even though they hold to the recapitulationist view and would not be expected to refer to the third and fifth trumpet scenarios to bolster their argument. Even though this diagram looks “busy” and complicated, it really is not. 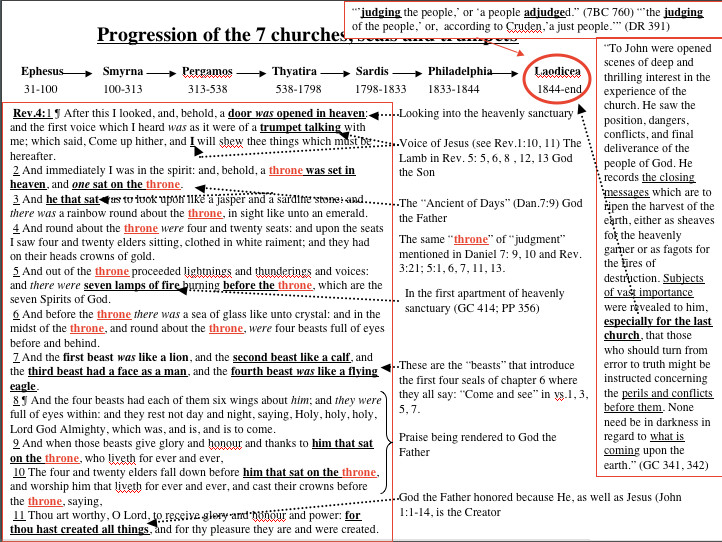 Start with the red box enclosing Rev.11:14 to 17 where the “third woe” and “seventh angel” are underlined in bold. Study the text which tells us that when the seventh trumpet is sounded God, in essence, takes back his “great power.” That suggests that He had previously relinquished it! In order to understand how that could have happened, we must refer back to Rev. 7:1 where four angels are seen holding back the “four winds of the earth.” Now, note the three red boxes containing statements from the Spirit of Prophecy that tell us what the “four winds” represent, namely “the terrible power of Satan.” When the four good angels release the “four winds,” it means that Satan will then “have full control” of the wicked, which is exactly what occurs when Jesus throws down the censer followed by the sounding of the trumpets in Rev.8:5-7. Consequently, Satan will be in the control of the wicked throughout the time of the first six trumpets. But, when the seventh angel sounds his trumpet, “The kingdoms of this world [will] become the kingdoms of our Lord” because He will have “taken to [Himself His] great power . . .” (Rev.11:17). That brings us to verses 18 and 19. 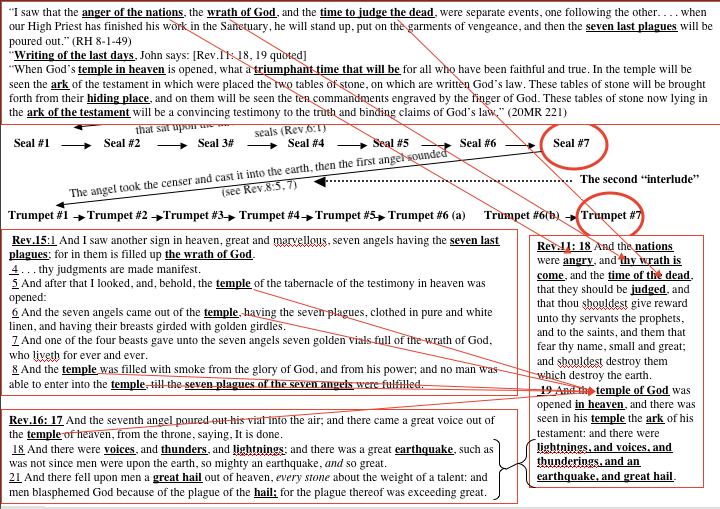 This diagram is intended to show the relationship of Rev.11:18 and 19 to the seven last plague scenario of Rev.15 and 16 with confirmation from the Spirit of Prophecy in RH 8-1-49 and 20MR 221. 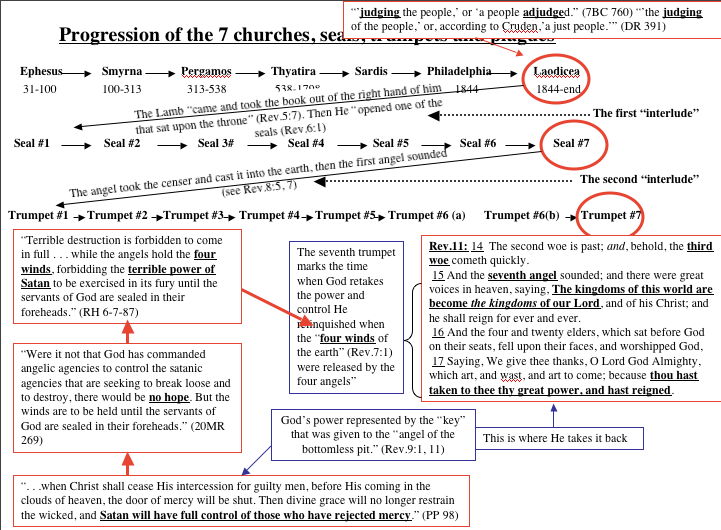 Then note the parallels pointed out by the red arrows between the “temple of God” in Rev.11:19 and Rev.15:5-8 and 16:17. 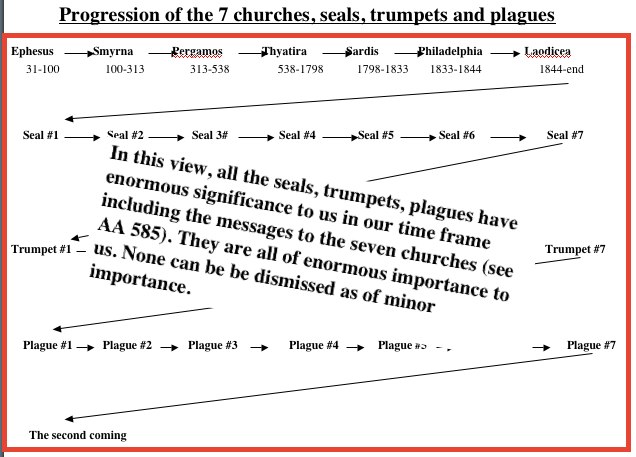 Probably the most convincing parallel is pointed out at the very bottom of the diagram where all five of the final events of the seven last plagues in Rev.11:19 match up with the very same thing in Rev.16:18 & 21. It seem unquestionable, therefore, that the seven last plagues grow out of or are the extension of Trumpet #7 or the “third woe” or “the seventh angel” and that “when he shall begin to sound, the mystery of God should be finished” (Rev.10:7) by the sounding of that trumpet. While it will take more than one plague to eradicate that “mystery,” clearly, when “the sixth angel poured out his vial upon the great river Euphrates; and the water thereof was dried up, that the way of the kings of the east might be prepared” followed by the “great hail” of the last plague (Rev.16:12, 21), even that might not be quite enough. 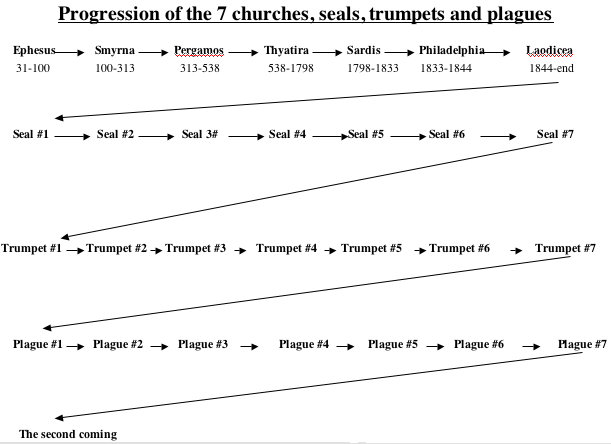 This diagram displays all three “interludes” followed by the the seventh plague scenario with is really the “prelude” to the second coming. Then, because the second coming is only depicted in the beginning of John’s vision in Rev.6:14-17 and 1:7, we must conclude it to be the great and final consummation in the progression formate. Note also that the “third woe” is all seven of the “seven last plagues” with the seventh being the “prelude” to the second coming. So, the progression view, as opposed to recapitulation, leads to only one final climax in the book of Revelation which, from my perspective, is the second coming. It transpires very soon after the seventh plague is poured out which makes Plague #7 the last of the four transition points. Clearly, no other event could finish the mystery of God like the second coming. Note that even the wicked have no doubt whatsoever about who God is. They are even able to identify Him as “the Lamb!” All their thoughts about Wormwood or Abaddon being God, has evaporated! This completes our study of the progression formate with its four main points of transition. 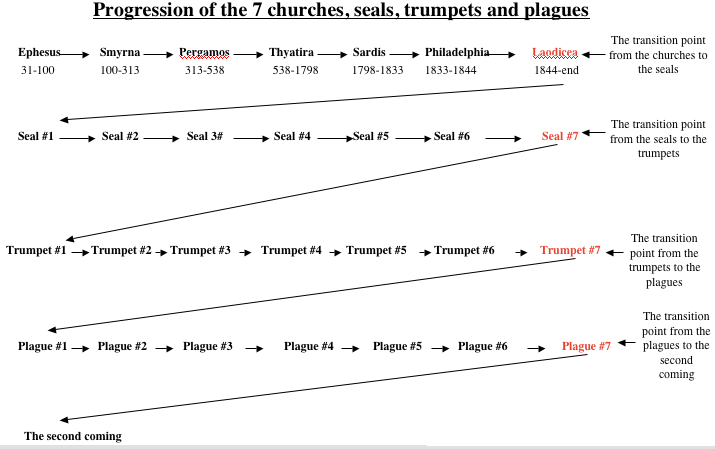 Obviously, there is much more to learn since this study did not touch on the first six seals, trumpets number 1, 2 and 4, and the first six plagues. However, in the following studies of the entire books of Daniel and Revelation, I have unintentionally followed the progressive view taking for granted that each chapter must be interpreted in the context of the previous chapters. 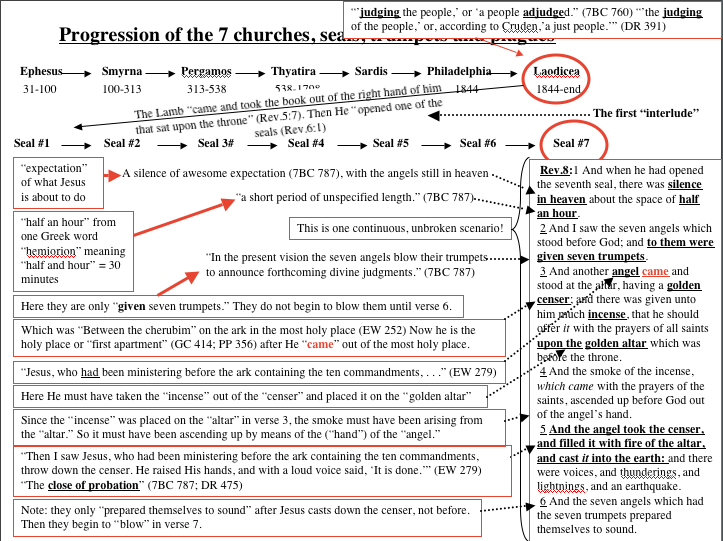 Note again that the “seven seals” are the extension of the last church. Then the seven trumpets become the extension of the seventh seal. Afterwards, the seven last plagues are the extension of the seventh trumpet and finally the second coming, the most climactic event in the history of the universe as well as the whole world, is the extension of the seventh plague.